The foundation, which utilises a pre-cast base with a raised centre section, allows the memorial stone and plinth to be bolted to the concrete base. The base itself is secured with stainless steel anchors into bored concrete plugs which penetrate 450mm into virgin soil at either side of the grave. Because the system relies only on mechanical fixing between the memorial stone and the stability base, there is no reliance upon a mortar joint. 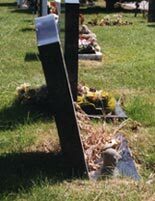 The mechanical fixing system also allows for the memorial stone to be easily removed should the need arise. (I) Epoxy resin two 20mm SS threaded studs 75mm into the headstone. Studs to project by thickness of memorial base plus 100mm. (II) Place concrete sub-base in position on unexcavated soil. (III) Drive a steel stake through the holes in the sub-base to locate positions of core plugs. (IV) Cut around perimeter of sub-base to mark ground to be excavated. (V) Excavate ground to a depth of 150mm to accommodate sub-base. (VI) Level excavated area with approximately 30mm cement/sand laid dry. (VII) Drill out core plugs with auger to 450-500mm depth. (VIII) Fill core holes with cement/sand mix (1/4 by volume). (IX) Place and level sub-base over core plugs. Drive 200mm threaded rod into wet mix to fall depth of the core plug, leaving the rod projecting above the sub-base by thickness of self locking nut plus 5mm. (X) Allow core plug to set. (XI) Place memorial stone base with the pre-drilled holes in position. (XII) Place gasket in position (to prevent damage to base during fixing of the stone). (XIII) Excavate area at back of headstone to allow washers and locking nuts to be placed on the ends of the memorial stone studs. (XIV) Lift memorial stone into position with the two studs passing through the holes in the base and the slotted holes in the sub-base. (XV) Carefully position memorial stone on concrete sub-base and tighten nuts. (XVI) Tighten locking nuts anchoring sub-base to core plugs. (XVII) Replace the earth and turf around the memorial stone to conceal the sub-base. On completion of the installation, turf or earth is laid over and round the foundation unit to the level of the bottom edge of the Base so that no concrete is visible. 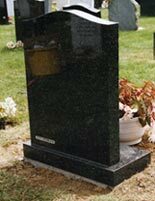 A secure vandal-resistant Headstone and Base on a foundation which can be totally concealed and which will allow for easy removal and re-fixing of the Memorial.